I was feeling dehydrated when i started running on the streets. I was so tired that i wanted to come home. But then, another runner told me that i could walk into one of the bar and deink some water. I did that, but was feeling a little embarrased. When i asked Alex Vera on how i can solve this issue (Alex guides me on many of my running stuff, as he is a good runner and training for marathon). Alex suggeted that i could buy a camel backpack that can hold water. He said that it should cost around $40. I was thinking of buying that for sometime now...but i was worried about carrying that on my back and also how i would clean it. 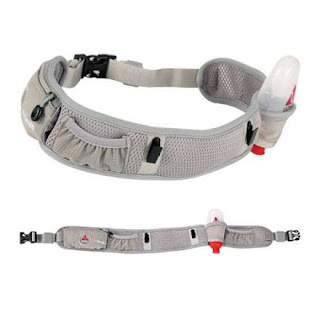 Today when i was taking my son on a stroller for a small walk, i saw a couple running and the lady had a belt that had packets for storing 2 bottles and place to keep her ipod shuffle and key pouch. So i started searching net for a product like that. I could not find the exact one, but the one in this link is closer to it. You can buy this product from here..